Submitted by User on May 26, 2009 - 22:17.
shortcomings. The major shortcoming I've seen is the fake (and perhaps too many) signals generated when the market is trading sideways. If anyone has ideas on how to improve the strategy then it will be most welcome. these are EMA5, 20 and 100. 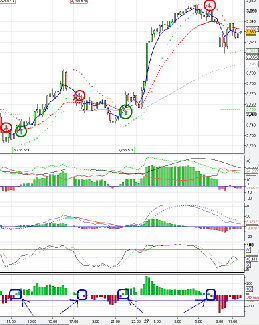 Submitted by User on April 15, 2011 - 03:19.
may be.. many Forex strategies are successfully used for commodities trading. Try it. Submitted by User on March 15, 2011 - 02:42. Hi sir is this strategy works for gold,silver and oil? Submitted by User on August 31, 2010 - 09:02. The post above was mine. 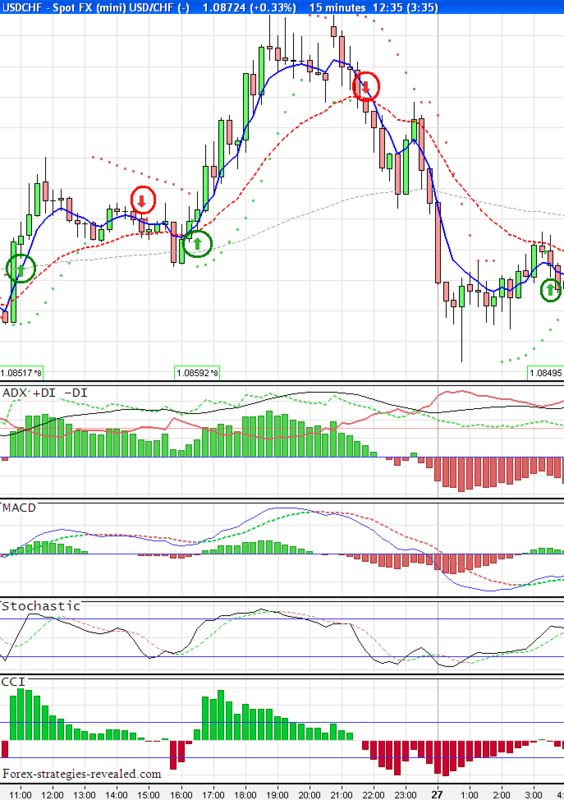 I left the stoch indicator out and am using CCI14 - ADX50 - MACD8,40,8. I'm trading on a 30M timeframe when the signals are good in both the 30M and 1H timeframe (late entry, but I'm happy with small profits). 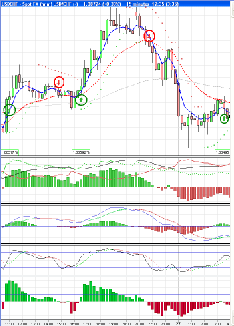 Had about 55 pips last week (2days) using this strategy (my first profit of 75 euros BTW). Submitted by User on August 25, 2010 - 07:29. On 30 min timeframe, I aim for a 10 pip profit, mostly because of the late entry. Submitted by Thomas on August 9, 2010 - 04:21. 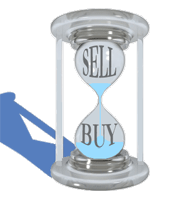 It sometimes late, but don't forget that other times it'll save you from a bad trade. Submitted by User on August 8, 2010 - 10:37. When the MACD signal line passes the 0, it's sometime too late to enter a trade.. Right? Submitted by Ayobami on November 28, 2009 - 08:26. Submitted by Nariman on June 25, 2009 - 22:34. I'm glad the combination is working well for you. Just wondering if it would be possible for you to share some charts with us which shows your entries and exits based on this particular (or the one you described) strategy. Submitted by Sam on June 22, 2009 - 21:15.
indeed a very nice confirmation system. 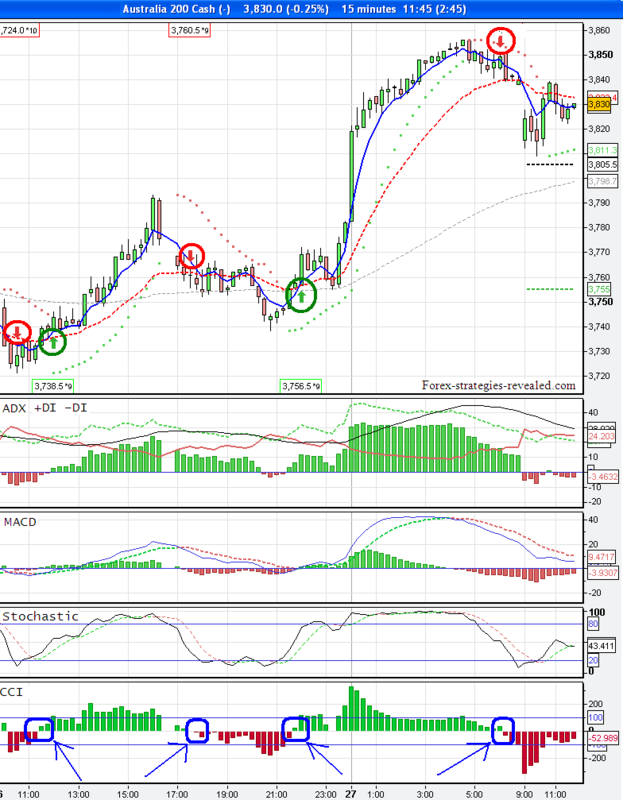 i use something very similar however i don't use the stochastic crossing the middle as the last confirmation. it generally gets me into the trade too late. impressive system. it works well for me on the e-mini dow. Sam from New Hampshire USA. Submitted by Nariman on June 10, 2009 - 18:24. Sorry for late reply, I'm actually not an MT4 user and therefore have no idea how to setup CCI in MT Platform. As Edward has kindly supplied files, I'm hoping this will help you further. Submitted by Edward Revy on June 10, 2009 - 15:12. Submitted by User on June 9, 2009 - 10:32. Bharat, I already asked guys about some indicators with histograms. It appears that we do not need histograms, just a line is enough. Submitted by Bharat on June 7, 2009 - 13:46. Edward, Nariman or anyone..... need some help with the CCI for MT4..... the example screenshots from Nariman shows the CCI having histogram style bars..... I dont have those in MT4, its just a line..... is is necesssary to have the histogram bars? Or is it ok to simply wait for the CCI line to cross above or below zero? IF there is a difference and one needs to have histograms on the CCI, can someone post this indicator for MT4 on here please? 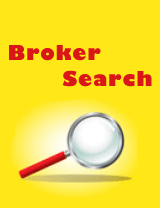 Just for information to all..... if you get the MT4 free demo version from www.alforex.com (its branded as AL Trade instead of Metatrader4), esssentially it is MT4, but they have EXPANDED it so that one can see the charts of the main US indices as well besides the forex charts. I find this great as I can then ave both forex as well as Dow JOnes, Nasdaq and S&P500 charts on one single platform, and I'm using various strategies on here on both currencies as well as indices successfully. Submitted by Indrek on June 7, 2009 - 08:45. Yes, the multitime indicators in the upper right corner come from TRO. I use GG-TrendBar_TRO_MODIFIED_VERSION for catching the overall trend (in combination with ADX, of course). The other one that is ultimately the best is TRO_MM_MAXover. As a default it is set to show the cross of EMA12 and SMA12 but you can change the settings as you like. I set it to show EMA5(close)xEMA6(open). Why it is wonderful - it shows also the crosses that are not fixed yet by a candle close. So, you can easily notice potential (pending) moves. The numbers at the screen come from TRO_PIVOT. I do not like to have too many lines at my screen, so I use the number version for planning my exits. The basic indicator that alerts me about crosses is not TRO, it is MA_Crossover_Alert. Submitted by User on June 7, 2009 - 00:49. Hi Indrek, are those TRO indicators? If they are, what are the names of the trend and the mtf ma indicators? He got lots of indicators and I don't want to clutter the indicator folder. Also, MT4 has a limit of how many indicators you can have in that folder.